Three men were charged with incitement for their involvement in a demonstration in Biak supporting the ULMWP bid for MSG membership. On 21 May, 17 people were arrested outside of Darfuar market in Samofa district, Biak, for demonstrating their support for a bid by the United Liberation Movement for West Papua (ULMWP) for membership of the Melanesian Spearhead Group (MSG). KNPB sources reported that Biak police forcibly dispersed the demonstration and confiscated three KNPB flags, a camera and a phone. While 12 people were released shortly after, five KNPB members were detained for further interrogation at Biak Regional Police Station. They were released after several hours of interrogation but are required to report to the police daily. On 22 May, Wamoka Yudas Kossay, one of the five KNPB members, was charged with incitement when he reported to the police. He was interrogated without legal representation and was only asked if he wanted a lawyer after investigators completed the Police Investigation Report (Berita Acara Pemeriksaan, BAP) for his case. He was also charged with incitement under Article 160 and was transferred to Biak City District Police Station to be detained. Kossay is detained alongside two other men, Apolos Sroyer and Dorteus Bonsapia, who were also charged with incitement under Article 160. According to lawyers from KontraS Papua (Komisi untuk Orang Hilang dan Korban Tindak Kekerasan Papua), on 19 May, KNPB members submitted a notice of demonstration to Biak police. Police reportedly called on the leaders of the demonstration to report to the Police Station. In response to this demand, on 20 May, Apolos Sroyer and Dorteus Bonsapia visited Biak Regional Police Station. Sroyer, the Head of the Biak People’s Local Parliament (Parlemen Rakyat Daerah, PRD), and Bonsapia were two of three people who had signed the notice of demonstration. They were interrogated overnight and transferred to Biak City District Police Station the following day. 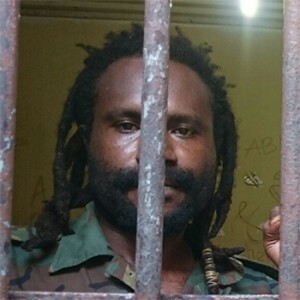 Reports from lawyers with KontraS Papua stated that on 23 May plainclothes officers from the Biak Regional Police searched Apolos Sroyer’s home without a search warrant. Police reportedly took photos of his home, his relatives and in particular a map of the states belonging to the MSG that was hung in the front terrace of his house. On 15 October, the trial for three men began. The three men face charges of incitement and spreading lies under Article 160 of the Indonesian Criminal Code and Article 14 of Law 1/1946 respectively. On 25 November, the prosecution demanded prison sentences of 1.5 years’ each for the three detainees. On 7 December 2015, the three detainees were sentenced to 10 months’ imprisonment each after being found guilty of incitement under Article 160 of the Indonesian Criminal Code. On 28 December 2015, recently freed ex-political prisoner Filep Karma visited the three detainees in Biak prison to express his solidarity.